Multiple projects are underway to protect specific neighborhoods from coastal storm-surge flooding, but a larger-scale approach—such as a regional barrier system—must be evaluated against other alternatives, as extreme storms are likely to become more frequent and intense. The Army Corps of Engineers should lead a comprehensive study to determine the need, cost, and feasibility of a regional surge barrier, emphasizing the impacts on communities and the region’s ecosystem. This should be done in partnership with relevant public agencies, the region’s academic institutions, and experts from private organizations and nonprofits. The region’s core has the highest concentration of people, jobs, and infrastructure, much of which are at significant risk from storm-surge flooding. Superstorm Sandy brought the core to a halt and left behind tens of billions of dollars in damage to infrastructure, homes, businesses, and other property. Investments in resiliency projects after Sandy were made at the local level to protect those communities, but many others will still be vulnerable. With this in mind, it is necessary to determine whether an investment in a regional surge barrier system will be needed over time and what impacts it could have. The most frequently considered barrier design would entail constructing a five-mile long “Outer Harbor Gateway” across the New York Bight from Sandy Hook to the Rockaway Peninsula, in addition to a barrier at the East River. Such a project would introduce an engineered system to a complex network of more than 30 rivers and streams. These include the Hudson, Passaic, Hackensack, and Raritan rivers; over a dozen tidal straits, such as the East River and Long Island Sound; and nearly forty bays, inlets, and coves, including Jamaica, Newark, and Raritan bays. Constructing a surge barrier has the potential to protect critical infrastructure and hundreds of thousands of residents and businesses from the effects of storm-surge flooding. There are nevertheless many unknowns about the impacts of building a storm-surge barrier on the interconnected network of natural systems as well as key questions around social impacts, governance, funding, and decision-making that need to be answered. Given the potential impact on the region’s residents, jobs, infrastructure, and property, the costs and benefits of a regional surge barrier need to be studied. In 2016, the U.S. Army Corps of Engineers (the Corps) began scoping for the New York/New Jersey Harbor & Tributaries Focus Area Feasibility Study, which will identify measures and alternatives to address coastal risk and determine potential future actions, which are likely to include a regional surge barrier. The study will result in a Chief Engineer’s Report to Congress, which could eventually lead to funding for the implementation of the measures recommended. As part of this study, the Corps should break out the proposed surge barrier into a more comprehensive study that invites research across scientific disciplines. In particular, the Corps should provide the funding for hiring the region’s academic institutions and private and nonprofit experts to help determine the need, cost, and feasibility of a regional surge barrier, emphasizing the impacts on communities and our complex ecosystem. Experts in policy, governance, and land use should each determine the potential implications to their respective fields. Failure rate and lifespan: Determine how often and under what conditions the barrier could fail, as well as the lifespan of an effective barrier. Sea-level rise: Because surge barriers do not protect against permanent flooding from sea-level rise or the inland flooding caused by stormwater, investments will still need to be made to protect or move populations and infrastructure. The rate of sea-level rise must also be factored in when determining the design, scope, and estimated completion date of any potential new surge barrier. Frequency of closure: The effectiveness, costs, and impacts of a surge barrier will depend on how frequently it is used. Frequent closings would raise maintenance costs and cause greater ecological impacts, but public or political pressure could lead to closing it even when there is only minimal risk of flooding. Infrequent closings could raise damage risks, and bring into question the ecological, political, and financial costs of building a surge barrier that is seldom used. False sense of security: Even areas protected by a surge barrier could end up needing additional protectio against inland flooding, sea-level rise, and high winds—as well as storms that could occur before a barrier is built. The decision to proceed with a barrier may create a false sense of security that could lead to delays in improving site-level resilience or transitioning away from high-risk locations—or cause them to be canceled altogether. Salinity/tidal area: Barriers have been shown to alter the circulation of water in and out of the system, regardless of whether they are open or closed. 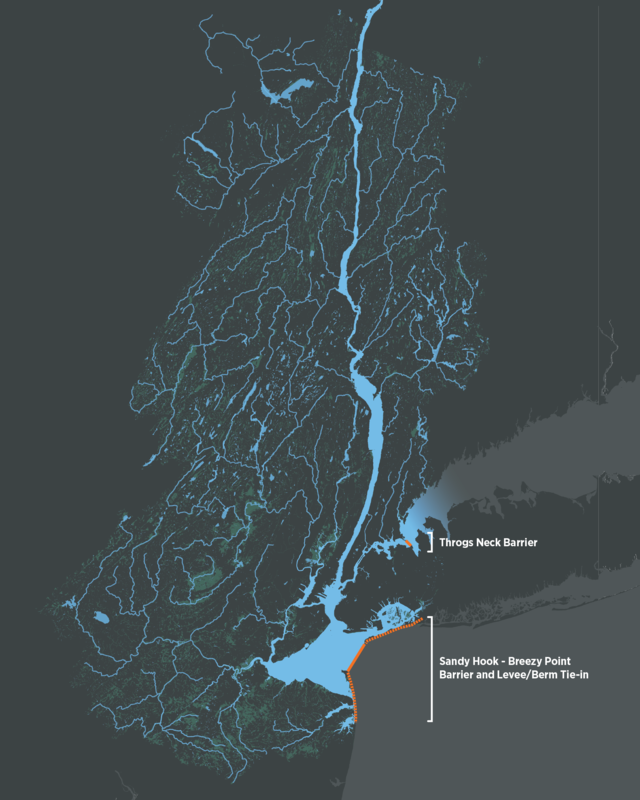 Estuaries—where freshwater and saltwater meet and the fish and wildlife therein depend on a given range of salinities—can be particularly affected. Water quality: When closed during a storm, a barrier will contain all of the water that normally flows out of the system naturally, as well as any accumulated stormwater, potentially concentrating pollutants and nutrients in the system. Sediment: Sediment distribution, which is necessary for wetland survival, could be altered or impeded by a barrier. Additionally, the bottom substrate in sites like the Hackensack, Passaic, and Hudson rivers has been found to contain industrial pollutants that could be affected by changes in the system from a barrier. Anadromous fish and wildlife migration: The estuary is home to a number of fish and wildlife that migrate in and out of the system over their life cycle (including shad, striped bass, blue fish, blue crabs, and young eels). It should be determined what level of interruptions to access would be harmful to migrating species. Resident fish and wildlife habitat: Resident fish and wildlife in the estuary find their niche on the bottom of the system based on a variety of factors ranging from substrate type, surrounding vegetation, water depth, etc. Any changes to the dynamics of the system could make portions of the estuary uninhabitable to resident species, such as the Shortnose Sturgeon, which lives in the Hudson River and is considered endangered. This designation ensures that any potential impacts on their habitat must be taken into account before any changes to the system are made. Potential greenhouse gas emissions: Changes to the salinity of an estuary system that is rich in nitrogen could lead to a chemical reaction wherein the potent greenhouse gas nitrous oxide is created. The proposed development of a surge barrier has led to heated, politically charged debates for a number of reasons detailed below. Constituents inside/constituents outside: As it is impossible to build a system that can protect the entire region from storm surges, many of the region’s residents would still be left without protection should a barrier be built. Debates over this dynamic could make the project complicated to design and approve. Resilience funding: There is a risk that a surge barrier could divert funding from other needed projects. For example, many adaptation projects, including large resilience investments being made in places like New York City’s Lower East Side and Hoboken in New Jersey, do not yet have full funding. Additionally, other infrastructure, including transit, wastewater, and energy systems face significant shortfalls in funding designated for maintenance..
Two states + New York City: Responsibility for the barrier, including who would determine when it should be closed and opened, will need to be assigned. Although many other municipalities would be protected by a barrier, the outer harbor gateway would require bi-state cooperation between New York and New Jersey for a multi-billion dollar project that has different benefits and consequences for each state. New York City—which would see perhaps the greatest benefits from the project—has already come out firmly against such a project, choosing instead to invest in local resilience measures. A comprehensive study that evaluates all of the potential benefits and costs of a regional surge barrier system, weighed against other adaptation measures, would provide critical information to decision-makers and the region’s residents about whether and when a regional surge-barrier system should be constructed. Without answering the questions described above, arguments in favor or against such a system would be based largely on incomplete information, conjecture, and emotion. Estimates for constructing a barrier range from $10 billion to $36 billion, with annual maintenance costs estimated between $100 million and $2.5 billion. Currently, the region’s planned adaptation projects are not yet fully funded, nor are upgrades to our transportation, water and wastewater, energy, and other critical pieces of infrastructure. Paying for a surge barrier will require new streams of funding that wouldn’t compromise local adaptation funding sources, and will sufficiently cover the necessary annual maintenance costs that ensure the system functions properly for decades to come.